Hi pinups! I recently held a vote across my social media to see which vlog people would like to see next on my YouTube channel. 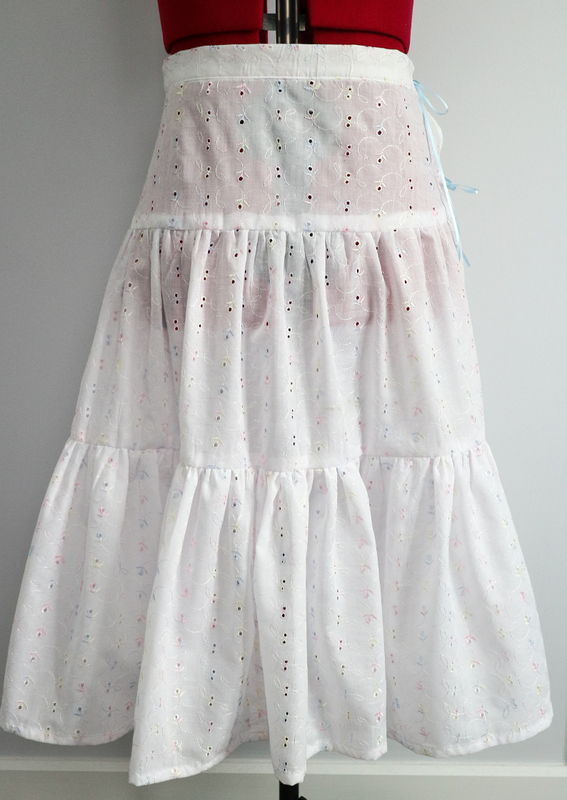 It was between seeing my first ever handmade dress or having a peek inside my sewing journal. It was pretty even across my platforms, but my first dress edged ahead slightly! 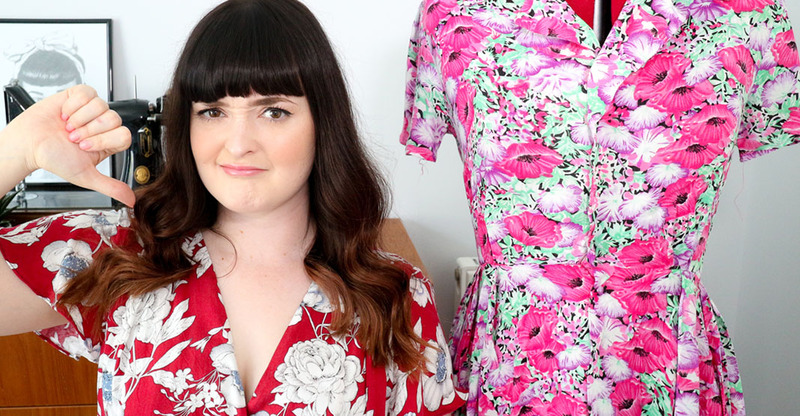 In the video below I have a good laugh at my first dress, whilst talking about how after sewing at university I almost gave up on sewing for good. This dress, surprisingly, put me on the right track! 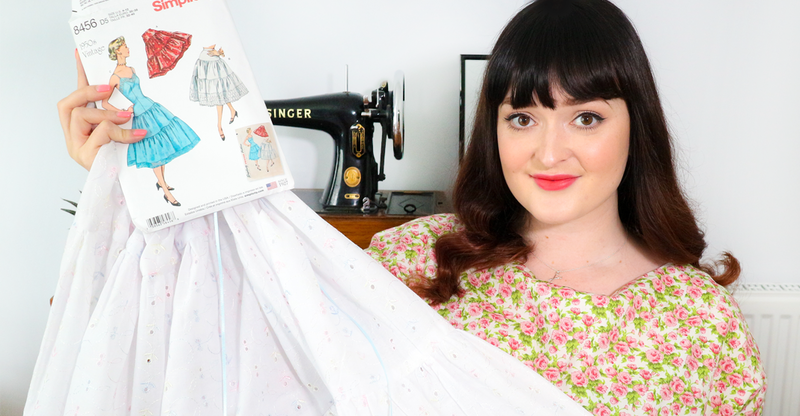 I hope you enjoyed this vlog and if you voted for a peek inside my sewing journal, I'll still be filming that one at some point too. Hi pinups! Since I started my sewing blog a couple of years ago and became aware of #memademay I like to take part but in my own way. Working from home, snapping a handmade outfit every day is very unrealistic for me when I spend my time in comfy RTW clothes, but I do still like to make a pledge of sorts. 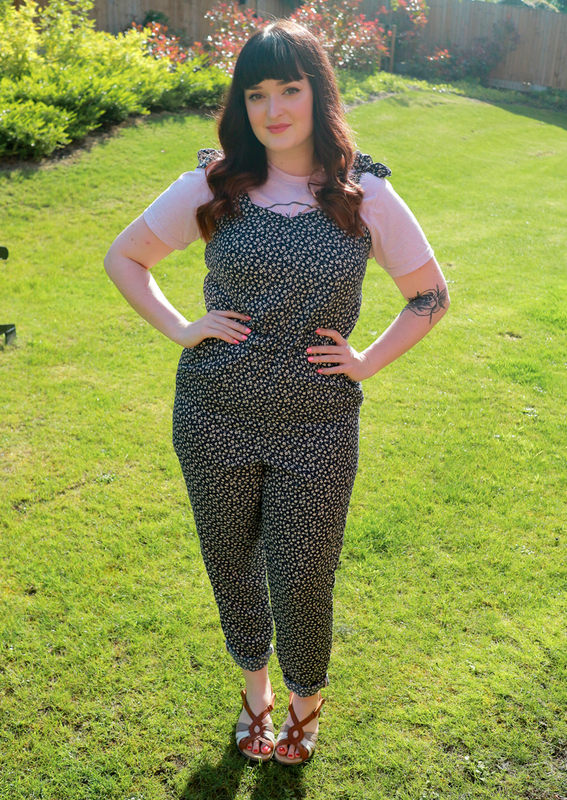 For Me Made May I like to sew and wear a new outfit for my birthday, and it just so happens, that's my Tilly and the Buttons Marigold jumpsuit! Difficulty: I had a couple of stumbles, so would say intermediate or advanced beginner. Watch out for: Make sure your crotch seam is well stitched for longevity. Make Again? : A surprise to me, but yes! Hi pinups! 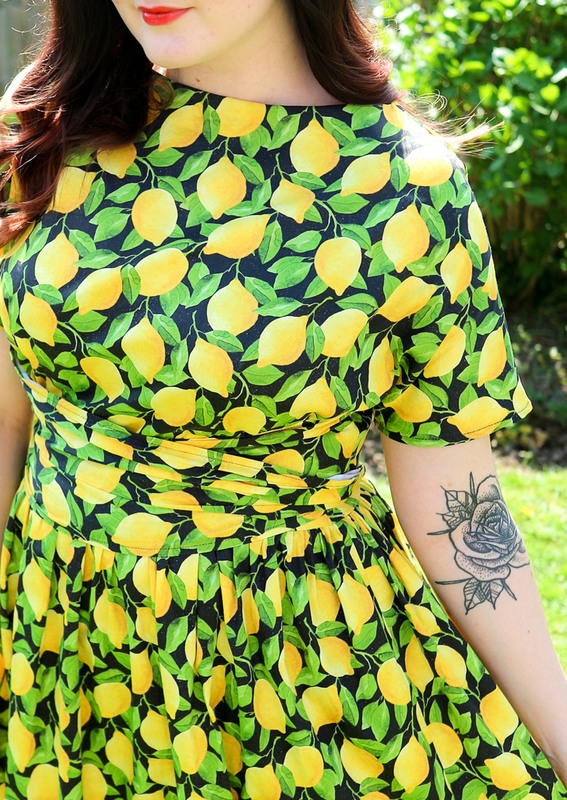 I'm so excited to be sharing this dress with you, for me this project is a dream come to life and it's all thanks to Spoonflower! 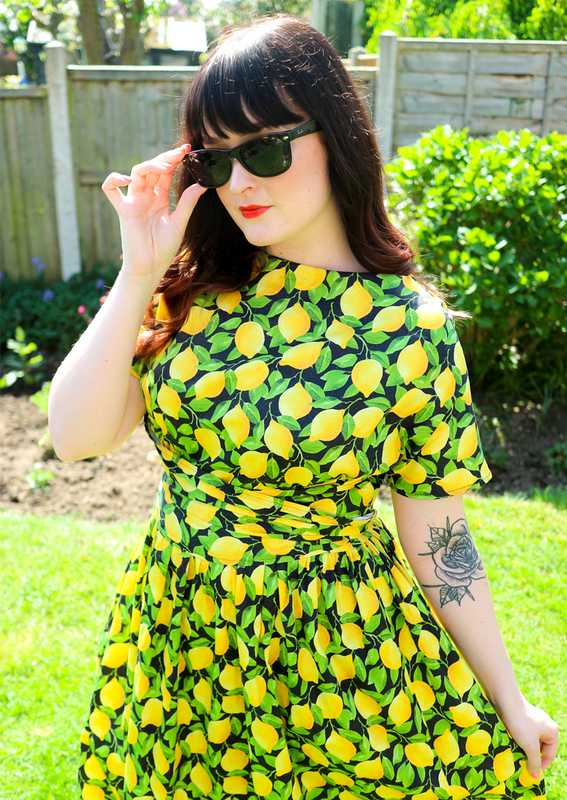 Last summer lemon print fabric was all I could think about and at the time it just wasn't a print that was easily assessable in fabric shops. 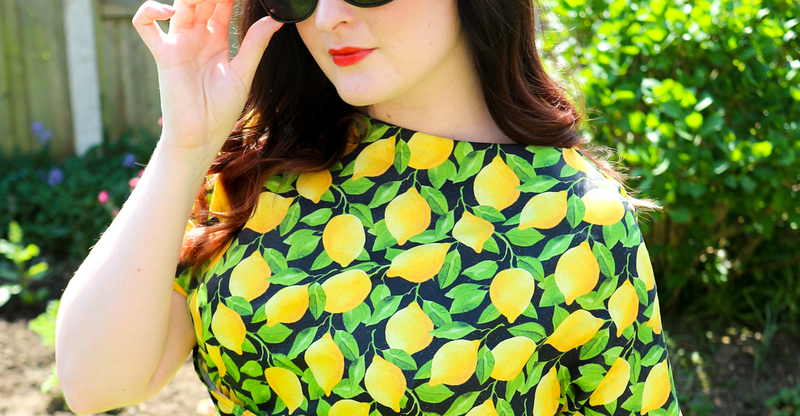 Lemon prints have since trickled into stores and this summer it looks like citrus patterns will be on a few people's sewing agendas. 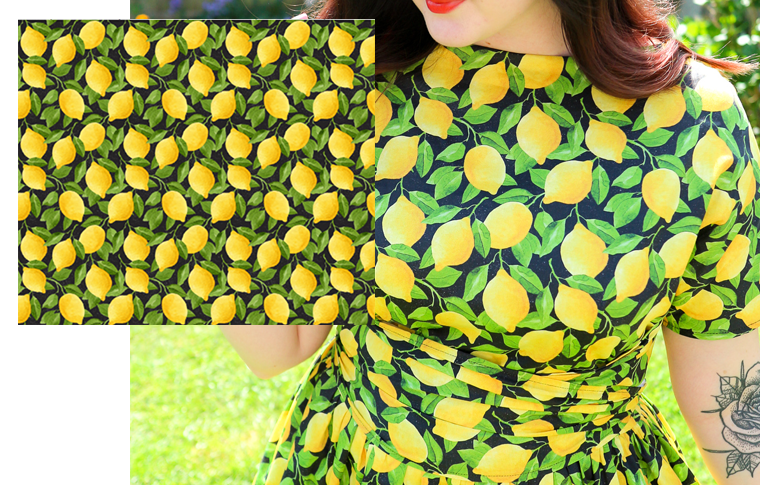 When I got cracking shopping for prints on Spoonflower's extensive collections, "lemons" was the first word I typed into the search bar and I was absolutely spoilt for choice immediately. I was overwhelmed by the amount of gorgeous lemon pattern fabric, from delicate illustrations to sharp and bold digital patterns. I must have looked for hours! I finally settled on one stunning design and opted for a simple vintage style dress pattern as my base to create. 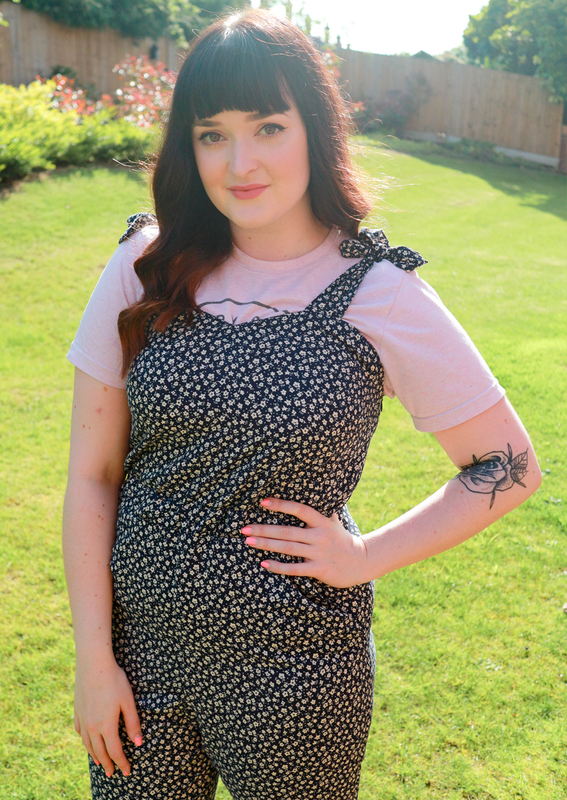 I've sewn the Retro Butterick B6318 pattern once before and loved it (check out my first post HERE), it's such a simple design and I love the t shirt length sleeves & waist tie. 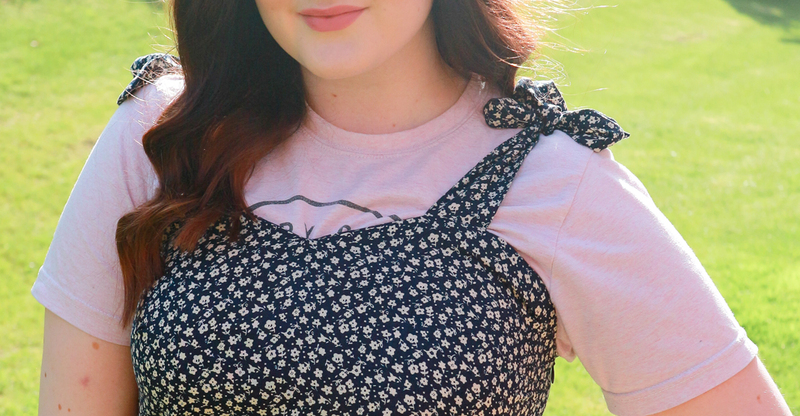 I think this pattern is really flattering for curvy figures like mine and paired with a bold, colourful fabric I hoped this would be a match made in sewing heaven. As I had been waiting for a year to own some lemon fabric I knew I wanted a fabric a little extra special. Instead of the usual cotton, I thought that Spoonflower's Organic Cotton Sateen Ultra fabric would compliment the print along with the full skirt of the B6318 pattern. The print has come out really well on the sateen fabric and once again the quality is just gorgeous and such high quality. The cotton sateen makes this dress feel a little extra special, but is still easy to wear and I would totally wear this for a nice day out. 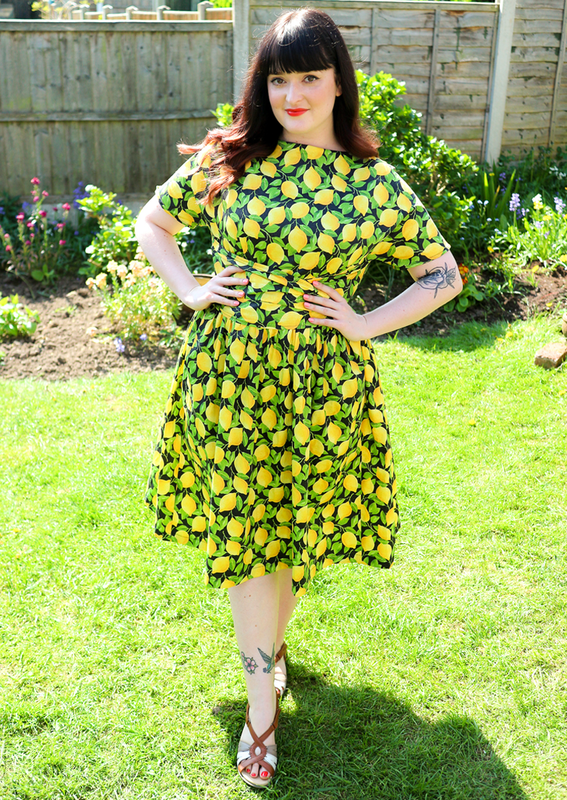 After all this time lusting after lemons, this dress won't be saved just for special occasions! Check out my top tips for shopping at Spoonflower in my first post HERE. You can see I took full advantage of the sun over May Bank Holiday weekend! 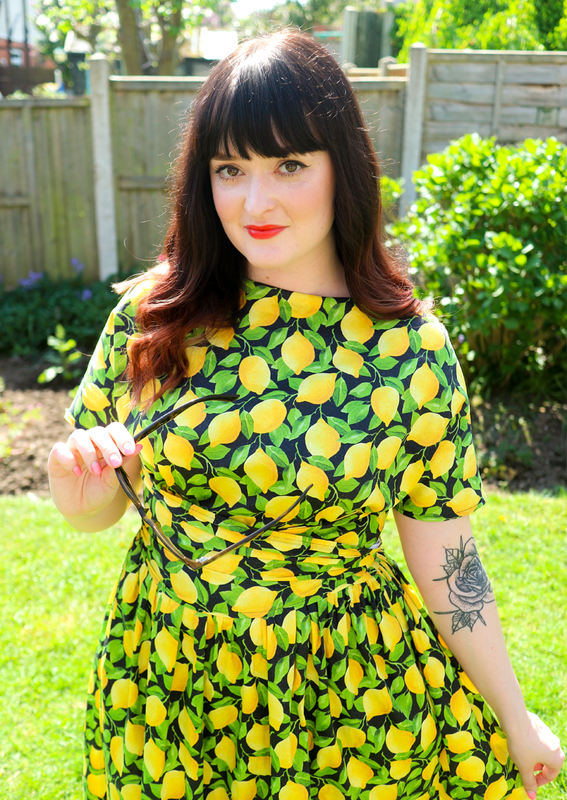 The weather was glorious and my lemon dress with a touch of red lipstick made me feel very glam for a Sunday in the sun. I was definitely trying to emulate some Dolce & Gabbana vibes with this dress and I like to think I succeeded a little! Whilst the fabric is super bold, I still find it very wearable. I think if I had chosen any other sewing pattern I wouldn't have felt the same, but these two are the perfect combination in my eyes. For me the fit of the B6318 dress is spot on. This time I shortened the waist about an inch for my short torso but that was the only alteration I made. For my figure the loose bust and waist tie work in my favour as I have plenty of room in the bust whilst still being able to pull my waist in to define my shape. Setting in sleeves is also one of my least favourite sewing tasks, so the dolman sleeve design is fast becoming my new favourite. Sewing time: Half a day or more. Modifications: Slightly shortened this waist. Watch out for: Even gathers, there's a lot! Make Again? : This is my 2nd and I think I see a few more in my future. 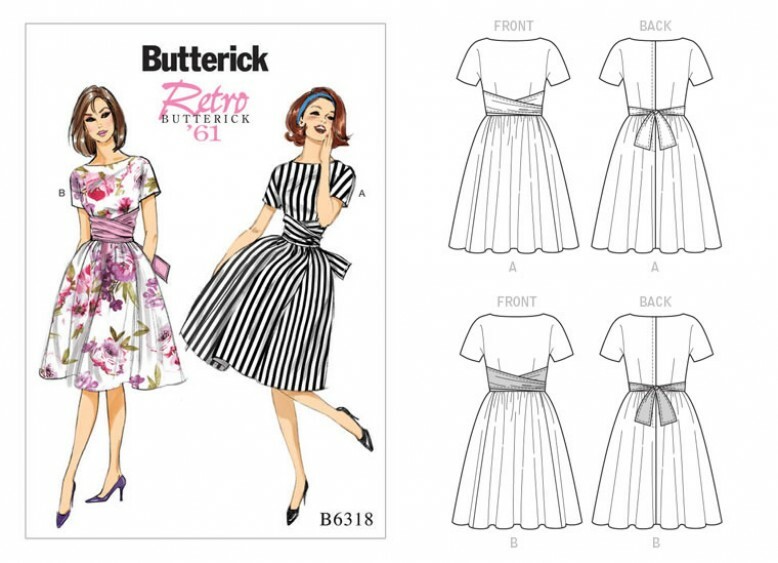 The Retro Butterick B6318 dress pattern has fast become one of my favourite ever patterns to sew. It's such a simple design but also easy to fit and to make. The simple pattern combined with this truly stunning Spoonflower fabric make for one show-stopping dress. Lemon fabric has been in my sight for such a long time and this design is certainly worth the wait. 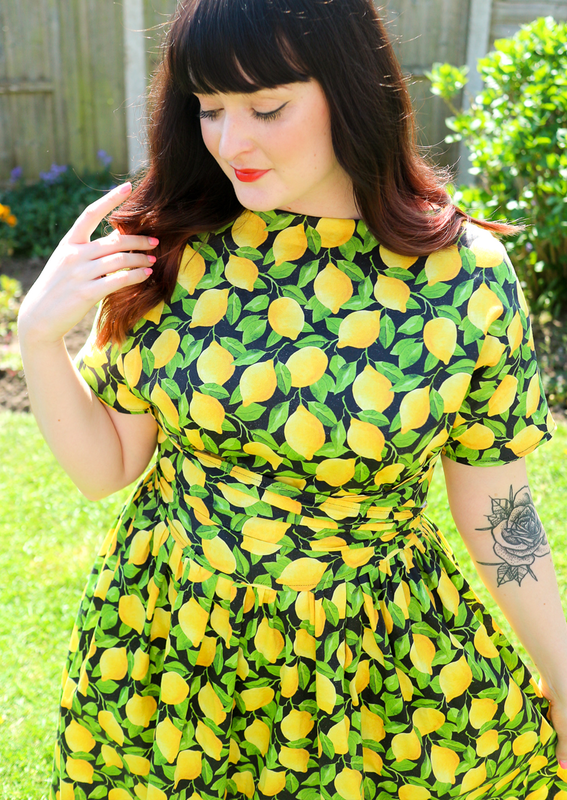 Overall, my lemon dream dress is everything I wanted to create. 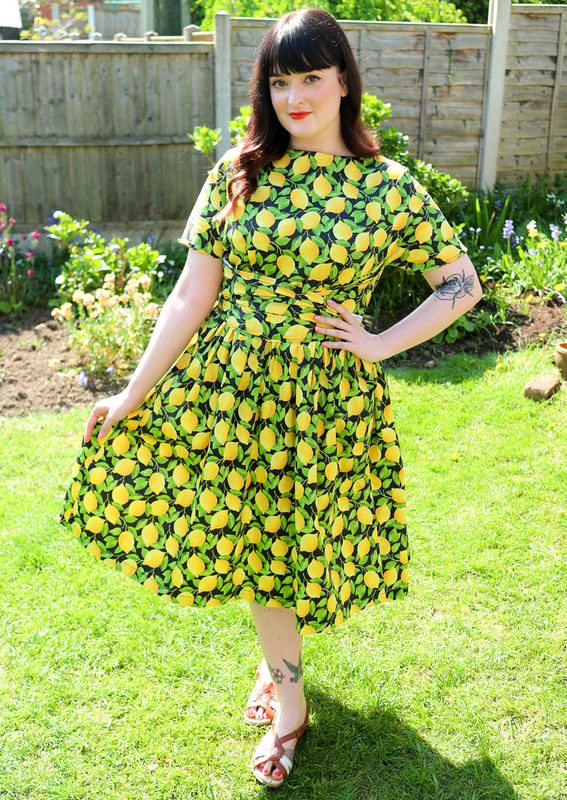 I just need the sun to come back out so I can enjoy a few more summer days feeling like a citrus pinup! Don't forget to visit Spoonflower to make your own fabric dreams come true! What designs would you search for? Have you ever shopped with Spoonflower fabrics? I'd love to see your creations! Disclaimer: This post in sponsored by Spoonflower. 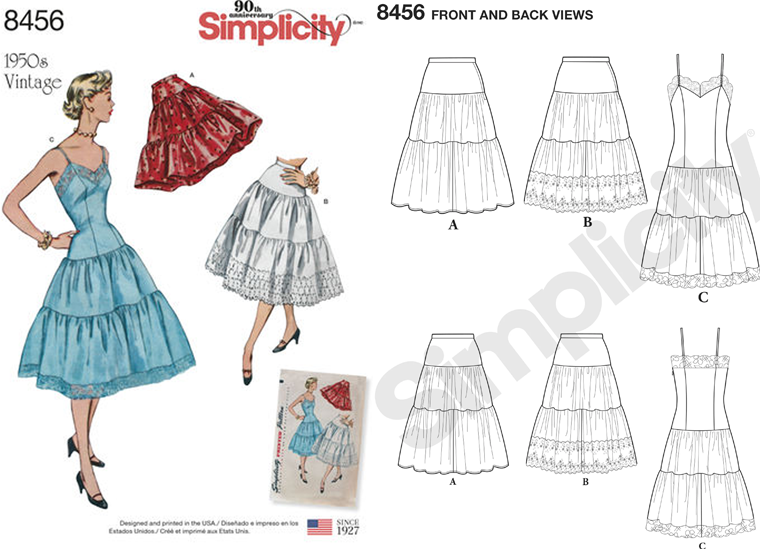 Simplicity 8456 - 1950s Petticoat + Sew Along! Hi pinups! Time for some weekend vintage sewing! When this pattern was released last year it caught my eye straight away. I've been toying with the idea of sewing a petticoat for a while, but was struggling to find a suitable pattern. I have previously drafted my own petticoat, but the tulle I used was cheap and scratchy, but Simplicity's 8456 pattern seemed like a great excuse to have a second go. 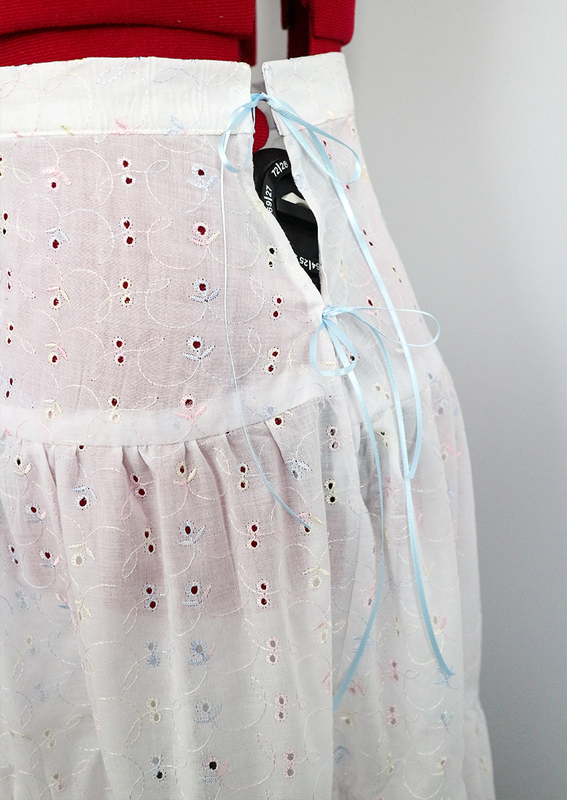 Whilst my first venture into petticoat making had the aim of creating something super frou frou and retro, this time around I wanted something more practical. After thinking long and hard about my wardrobe and the clothes I actually wear, I decided an underskirt in cotton would fit in nicely. I wanted a simple cotton petticoat to wear under my vintage style dresses for some soft and comfortable fullness, whilst also giving me an extra layer under the dress for more translucent fabrics and you know, in case I fall over or the wind blows my dress up... Option A of the 8456 pattern ticks all the boxes. 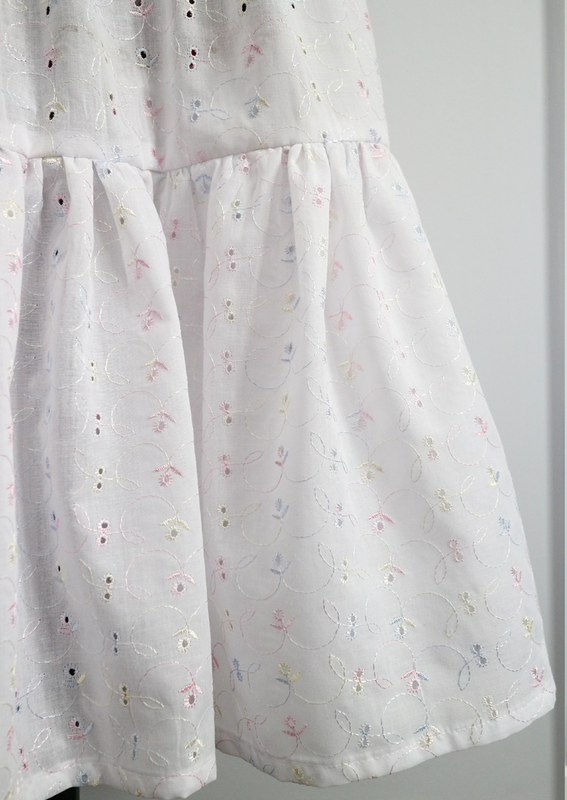 So in my video I hope it comes across just how easy this petticoat pattern is! I hoped it would be simple, but I didn't think it was going to be so fast. An all round great pattern which would definitely suit beginners. In the video I go into more depth about this, but I opted for a delicate ribbon tie at the side instead of a zip or poppers. 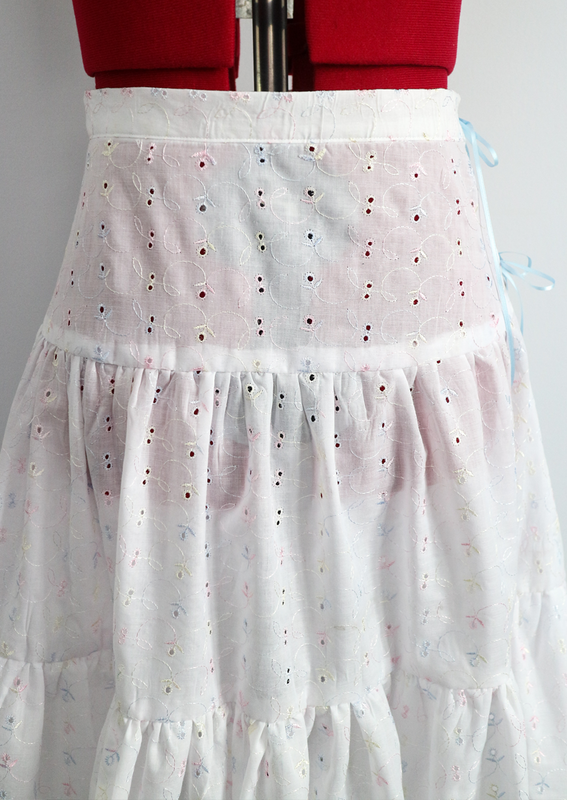 I'd love to sew this skirt in a gingham seersucker fabric, in which case I would insert a zip. But the ribbons for me mean this underskirt fits me great with the added flexibility. Fit: A little tight on the waist, but nothing ribbons can't fix! Watch out for: Even gathers. 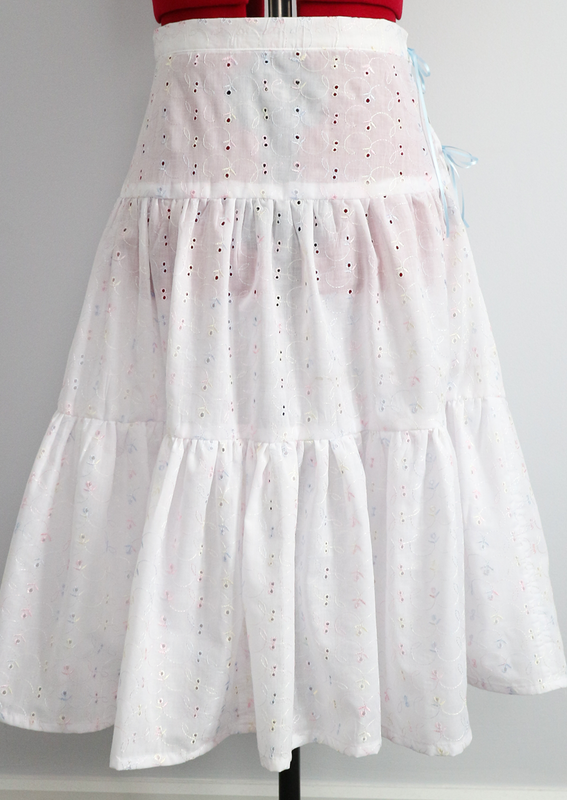 Overall, I love the 8456 petticoat pattern. The underskirt I made is exactly what I wanted to wear under my retro dresses and I know I'll be getting a lot of wear out of this one. I think the pattern is so versatile and will suit so many different fabric types. Like I said I would love an outer-wear gingham version, whilst also maybe one day sewing a totally fluffy organza petticoat. But for now, this cotton eyelet style is just what I needed. Let me know if you'll be trying this pattern and be sure to tag me @craftypinup in your snaps so I can see them too! Watch all my Simplicity Stitch by Stitch videos in my playlist HERE. Hi pinups! I can't get my head around how fast these posts feel like they are coming round! When I type them, I always wonder what I'll be lusting after in the next few weeks that will keep my monthly series interesting. Yet new things keep catching my eye, especially with the seasons finally feeling like they may be changing. Ruffle dresses are all over the high street and it's a trend that I'm ready to sign up to. 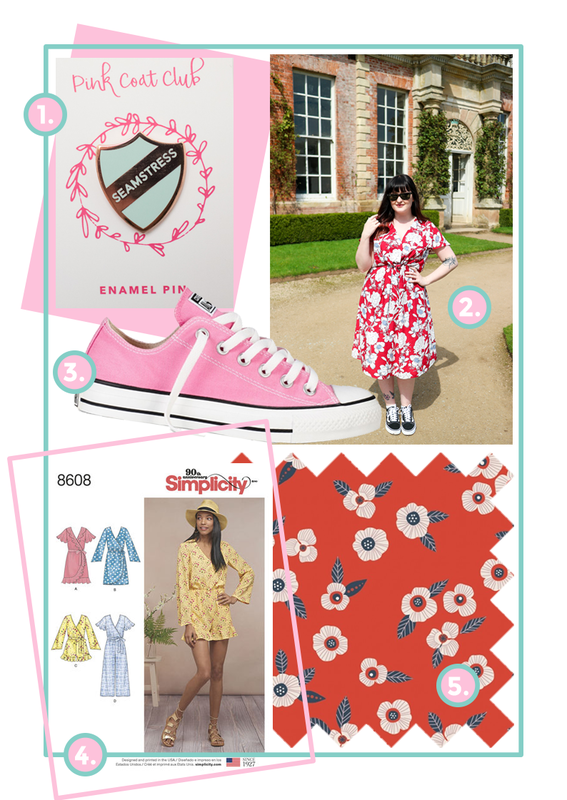 Whilst the world of sewing patterns aren't always up to speed with these fast high street trends that pop up, Simplicity didn't let me down with their new 8601 pattern. After sharing a snap on my Instagram account, it seems I'm not alone with falling in love with this pattern. It's straight to the top of my must sew list. With an influx of pretty Spring and Summer sewing patterns coming my way, of course some new fabric will follow (at least in my case). You guys know I can't resist a floral, which you'll surely know if you watched my latest fabric haul blog HERE, and red florals get me every time. This one is following me online I swear! Has anyone else noticed a wave of sewing pins hitting shops? I seem to have gone from 1 to 100 in the space of a month, but with a new denim jacket in my wardrobe, I'm not complaining. 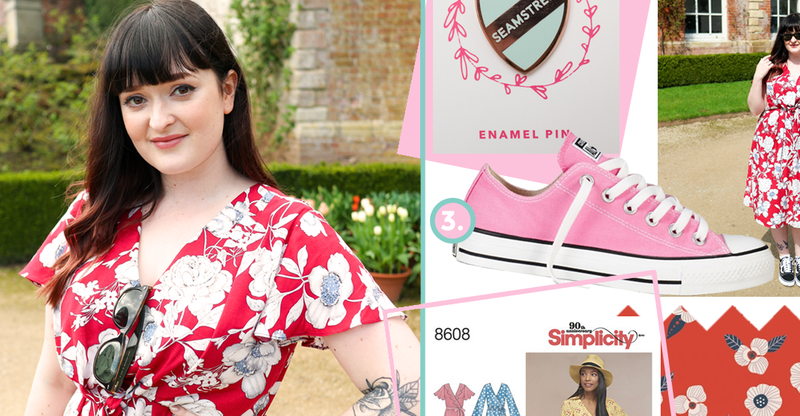 Have you snapped up your must have 'Seamstress' pin yet? Working from home can quickly feel isolating and before you know it 5 days have passed and you haven't left the house. This is something I'm trying to make a conscious effort to change. I was recently gifted a lifetime National Trust membership and now the weather's starting to brighten up it's the perfect time to start planning some adventures! 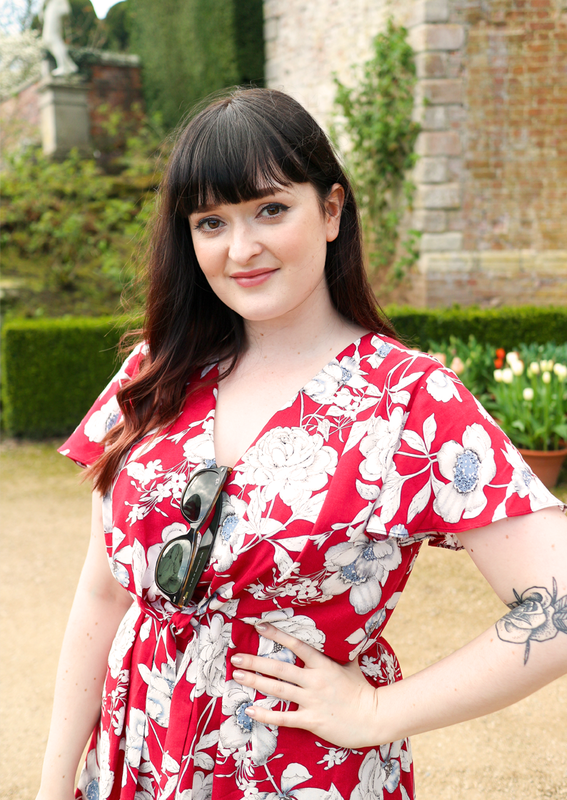 In April I visited the beautiful Powis Castle where I wore my new favourite dress (which I spoke about in my March post) and had such a lovely day.